So when people ask me how to “get into” upcycling, I always steer them down the path of storage and organization. So many unusual items from the thrift store, antiques market, or found on your neighbor’s curb can be easily transformed into something you can store your possessions in, OR a gathering place for ‘like’ items. Sometimes all it needs is a coat of paint…other times, it might require a little more elbow grease. Whether you take it apart, re-assemble with new pieces (like adding hooks, for example), or just clean it up and drop some paint brushes in it, the storage and organization project ideas are seemingly endless. And because we all want to be organized and get more storage bang for our existing buck, I’ve created an entire library of DIY repurposed and upcycled storage and organization project ideas to help you get your life and home on track and in order- just click the thumbnail of any project to go straight to my tutorial! See, upcycling can be as easy (or complex) as you want it to me- and will inevitably create even more organization / storage project in the years to come! It makes for an eclectic, frugal, and fun life- certainly something anyone…and I mean anyone…can achieve! So many creative and lovely organizational ideas!! Love the bracelet mug rack and the magnetic board! Appreciate your sharing such inspiration with us!! Fantastic ideas! I did the same with the bracelet rack. There are so many neat things to find at thrift stores to repurpose! I know!! I can never pass up a thrift shop, no matter where I am! The cookie sheet magnet board is so cute! Definitely! And thanks so much! The paper towel holder is a great way to store your ribbons. These are some really great organizational ideas! I would love it if you’d stop by and share tonight at 10pm at the Totally Terrific Tuesday Link Party! Yes, ma’am, it’s on my calendar! 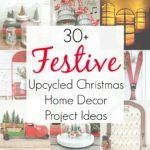 You have lots of great upcycling ideas here. Thanks for sharing on Merry Monday. I love the spice rack!!!!! Great ideas. Thanks for linking up to On Display Thursday. Thanks for sharing your post at the HomeAcreHop-Loved the ideas. I love finding a new purpose for something. I so need to organize my crafting area. Desperately! Thanks for linking to Show Me Saturday. Great seeing all these in one place! I thought my mother was the ONLY one who did the plastic bag in the leaky boots trick. And she’d use a Cut-Rite wax sandwich bag repeatedly to help our shoe heels down into the boots, too! She was born in 1915, survived the Depression, and never wasted anything! We had colored pillowcases long before colored linens were cool when I was a child; a gathered skirt at a rummage sale was .10; it made 2 pillowcases! Took me 25+ years to wear out my flour bag pillowcases! She’d be amazed at this upcycling; she used her microwave for Tupperware storage space and reheated leftovers on the stove! You certainly had a great year of projects! Thanks for sharing at Vintage Charm! That canoe paddle hanger is adorable. And I would want one even if I no longer live near a beach. Wow these are amazing! Some of these craft ideas can be transformed into moving crates when you are house relocating. It is cheaper and more Eco-friendly than using cardboard boxes. Such great ideas!! It is always best to use what you have than spend unnecessary .